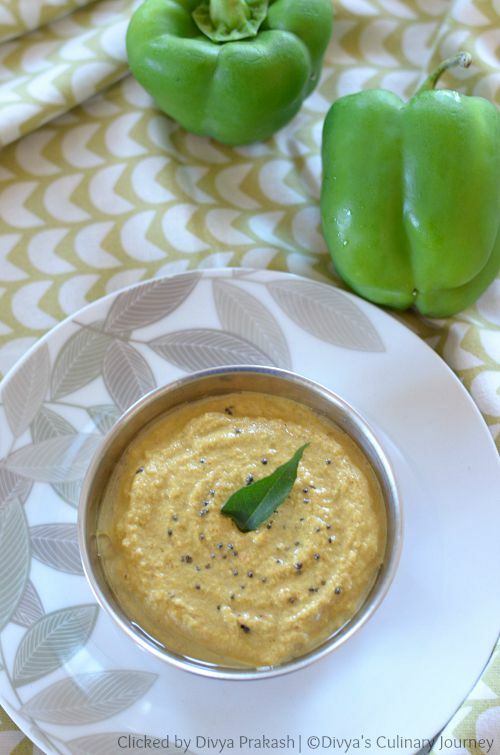 The recipe I am sharing today is Capsicum Chutney. There are capsicums still left in the bag hubby got last week and I am trying to use them in different ways to feed both my family and blog. After posting capsicum masala curry , a side dish for Chappathi, I wanted to post a side dish for idli and dosa too. So yesterday tried this coconut based capsicum chutney to serve with dosa for dinner. It came out delicious and everyone loved it. How to make Capsicum Chutney? Heat oil in a pan,add cumin seeds and fry, then add urad dal, channa dal and red chillies and fry for 2 minutes, then add chopped onions, garlic and bell pepper and saute for about 3-4 minutes. Then add tamarind and saute for a minute. Then add grated coconut and turn off the heat. Let it cool and then add salt , enough water and grind it into a fine paste. Transfer it into a bowl and serve it. I used green bell pepper here, you can use red or yellow ones too. You can temper them at the end. Heat oil, then add mustard seeds and when they crack, add curry leaves and fry them and add it to ground chutney. Or you can skip this process. What do you use to grind this at the end of prep? It looks like hummus and sounds delish. That would have so much flavor, I love this! I have never heard of anything like this before! Sounds good though! Love this chutney with idli and dosa. Yum!!! Oh yum! This chutney looks absolutely wonderful!! What a wonderful chutney...so full of fantastic flavors! What a great dip for entertaining. Looks wonderful. I love chutney and your capsicum version looks and sounds amazing! So many wonderful flavors, looks delicious! 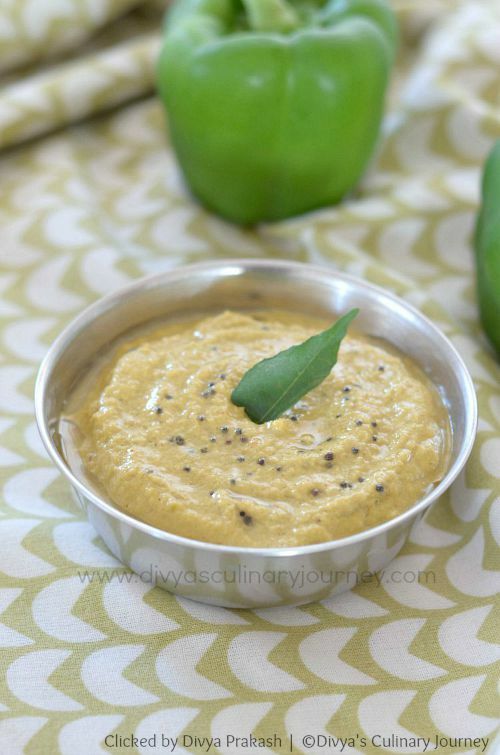 I love the fresh flavor, texture, and color of this chutney; thanks so much for sharing! Beautiful Chutney! Excited to try this recipe out! 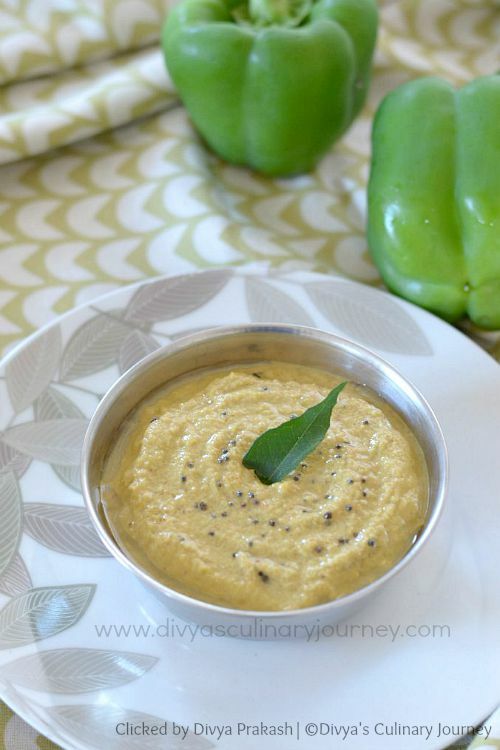 Your Capsicum Chutney Recipe looks amazing and I would love to try it. Man the color is outstanding and so fresh looking it jumps right out at me. I've made chutney a few times, and yours looks so good. Mine have never looked like this one! And all those flavors you have here are wonderful! Yum!